The body functions better with good posture. When you stand up straight, you appear taller, thinner, and stronger. This makes you more attractive to others and less likely to be the victim of a crime. So here are some tips that will help you avoid looking like a dreary and vulnerable old hunchback. It’s hard to know if you have poor posture if poor posture is all you’ve ever had. Many people with rolled shoulders, sway back, and anterior head carriage have no clue that these are problematic. But there’s a unique feeling to good posture. After you learn what it is, improving your posture will become much easier. Now, I’ve ransacked chiropractic trade shows trying to find videos that can help patients improve their posture at home. Most of what I’ve seen is dated, overpriced, and a real snoozefest. But I finally found one that held my attention from start to finish, and I’m comfortable recommending it. It’s a DVD by Janice Novack called Posture: Get it Straight! The first time I watched the video, I noticed a change. I’ve never witnessed another posture program work this quickly. What really sets it apart is the emphasis on using a theraband (which comes with the DVD for free). This helps you get faster results by strengthening postural muscles instead of just stretching them. It’s easy to slouch when we’re bored, or droop our head while focused on important tasks. 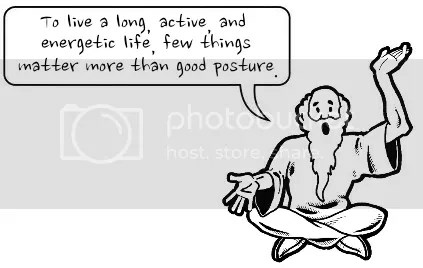 But if you want great posture, you need to be attentive and aware of your body position at all times. This requires daily practice to replace your old habits with new ones. One way to aid in this process is by purchasing some posture apparel. This new fabric technology can help people improve their posture simply by wearing it throughout the day. When I started reading about these unique shirts, I made the mistake of assuming they were exclusively for athletes. But after doing some more research, I learned that anyone can wear them. So I got my hands on two different brands and will share my experience with you. The first kind I tried was Evidence Based Apparel (EBA) by Alignmed. I wore their v-neck poly/spandex blend Posture Shirt for several hours daily for an entire week. Putting this shirt on was mechanically different than a standard undershirt, but I got used to it right away. Once on, it clings to the body like you’d expect spandex to do, and provides a compression effect. The back of the shirt has special fibers that promote upright posture. When your shoulders roll forward or you find yourself hunched over your desk, there’s a kinesthetic change that becomes instantly noticeable. With regular clothes, you wouldn’t realize this was happening. With the Posture Shirt, however, you can’t help but want to sit up straight. The second brand I experimented with was a sleeveless tank by Intelliskin called the Foundation Posturecue. I wore this to the gym every day for a week. The material is slightly different from the EBA shirt. It’s more like an ultra thin wetsuit material that fits even closer to the skin. I appreciated how long the material was in the torso – I’m 6’2″ and at full stretch it reached below my hips. The posture-improving aspect was virtually identical to the EBA. What I really like about wearing this shirt was the effect it had on the duration of my workouts. I performed two more sets than I normally do on chest/back days. Having tracked my workouts every week for over two and half years, I can only attribute this improvement to the shirt. This was a completely unexpected but entirely welcomed bonus! Between the two, I can’t say that I favor one over the other. I love them both! I believe the sleeveless Intelliskin was better at wicking moisture away from the body. For this reason, it’d my choice for fitness and exercise activities. On the other hand, Alignmed’s EBA would be my choice for everyday usage. I’m sure you could use either brand for any activity though. Take a look at the ergonomics diagram on the right. This is how your posture should be while sitting at your desk. 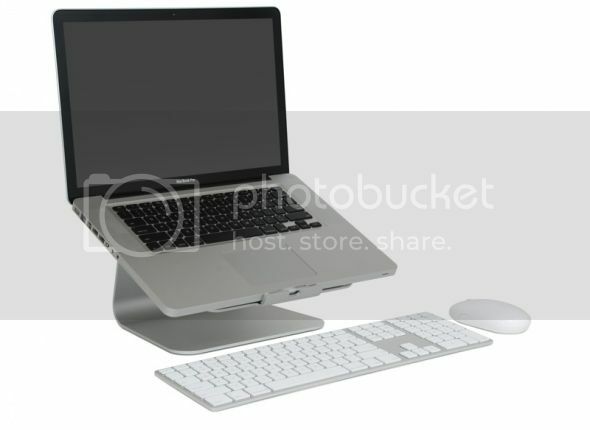 If you use a laptop, consider purchasing the mStand by Rain Design. When used with a wireless keyboard and trackpad, it creates a workstation that’ll make even the most priggish ergonomics expert swoon. Here’s a picture showing how these items look when used together. The foundation of good posture begins in the spine. The best posture products on the market won’t do much for you if the spine is misaligned. So find a reputable chiropractor in your area to identify and correct any measurable spinal imbalances. If you need some help finding a chiropractor near you, here’s the directory I use. Ladies, don’t wear high heels unless you absolutely have to… If you must, keep them as short as possible. High heels shift your body’s center of gravity and put unnecessary strain on your joints. When sitting, keep both feet flat on the floor. “Pillow posture” is important too. Make sure you sleep on your back or side, using a pillow that’s firm enough to keep your head level. Here’s an article I wrote about pillows. I’d like to know if you’re clearing more graphs wearing those posture shirts, LOL. Good article. Most of us today due to our busy lives do not really pay attention to the way we sit and the way we carry ourselves around. Apart from the long hours spent in front of the computer or at the desk, there are other activities which affect the posture. Driving I think is there at the top of the list of causes of problems caused due to a bad posture. A good posture definitely goes a long long way in taking care of the spine, not to mention what it does to one’s body language and confidence. Posture is absolutely necessary today more than ever, but included with posture are the exercises to help those areas that have become deconditioned. Great post and great tips! I try to relay the same kind of information to my patients, but this is much more concise and clear than I could ever hope to be. Thank you for this post and the great tips that you have provided! I also try to advocate getting up at regular intervals to stretch or walk around in between extended periods of sitting. It seems that people are able to get seated in their chairs properly at first, but soon begin to slump and crumple into their chairs as time passes. Sometimes getting up to stretch and “reset” can also work wonders!